Chuck Olin (1937-2005) was a documentary filmmaker from Chicago. He was a member of the Film Group, a production company that created a number of films about the social and political unrest of the mid 60s and early 70s, many which have been preserved by the NFPF including CICERO MARCH and THE BATTLE OF MICHIGAN AVENUE. He later formed his own production company – Chuck Olin & Associates. Olin’s entire film career was built upon addressing social, political and artistic movements and causes. The National Film Preservation Foundation has awarded CFA a grant to do restoration and conservation work on two films made by Chuck Olin. 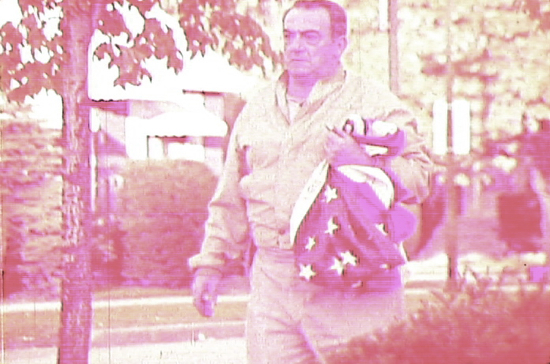 8 FLAGS FOR 99 CENTS (1970) is a rarely seen documentary about a blue-collar community’s growing unease with the Vietnam War. The Chicago Chapter of Business Executives Move for Vietnam Peace sponsored the production of this film. Chuck Olin and Joel Katz were co-producers with Mike Gray & Associates. A MATTER OF OPPORTUNITY (1968) is a film sponsored by the American Medical Association and the National Medical Association. It is built upon interviews with Howard University medical students who discuss changes needed to open up the medical field to the African-American population. Chuck Olin also produced this film in conjunction with Mike Gray & Associates. Together both films provide a taste of political/social transformations from that era – one at the grassroots community level and the other at an institutional level. CFA thanks Andy Uhrich for his initial research of these two films and is grateful to Joanna Poses and Kate Pourshariati for inspecting one of the few other prints in existence of 8 FLAGS FOR 99 CENTS at the Swarthmore College Library. Thanks to Wendy Chmielewski for making their research possible. 8 FLAGS FOR 99 CENTS was produced in response to President Nixon’s famous November, 1969 speech when he contrasted the unlawful and vocal anti-war protesters to the respectful “silent majority” who were in favor of remaining in Vietnam to fight communism. This film explores the thoughts and opinions of the “silent majority” represented by the folks living in the Garfield Ridge neighborhood on the southwest side of Chicago. Chuck Olin and Joel Katz deliberately chose to mine the images and thoughts of this conservative, blue-collar community that shares a border with Chicago’s Midway Airport and is nestled among strip malls, restaurants and interstate highways. With this film, Olin and Katz had planned to create an admittedly strident anti-war propaganda piece. The intent was to discredit the then current government policy by laying horrific war images over the patriotic and pro-war comments of the “silent majority” living in the outskirts of Chicago. This technique of editing violent and disturbing documentary footage over sound bites that drastically conflict with the images being shown had been successfully employed in the 1968 Urban Crisis film THE RIGHT TO DISSENT: A PRESS CONFERENCE. 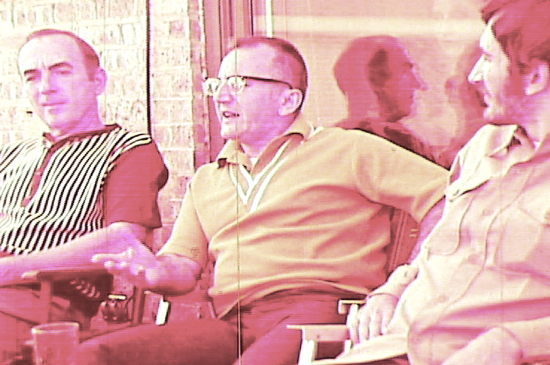 Shot during the 1968 National Democratic Convention in Chicago, THE RIGHT TO DISSENT features Mayor Daley’s press secretary as he assures television broadcasters and other journalists that there is order and control in the streets. Lengthy cutaways to violent images of youthful protesters, middle-aged housewives, and journalists being dragged and thrown into paddy wagons belie the words that are being spoken at the press conference. Nevertheless, this technique would not be useful in 8 FLAGS FOR 99 CENTS. The surprising commentary that arose from the Garfield Ridge community turned the filmmakers’ expectations (as well as conventional wisdom of the times) on its head. Expecting to record pro-war and pro-government slogans and sentiments, the filmmakers were caught off guard by the thoughtful, nuanced, and distressed analysis articulated by those that were interviewed and recorded. Contractors, firemen, mothers, fathers, barbers, Vietnam vets and clerks have varied and layered thoughts on America’s involvement in the war. One 20 year-old store clerk is most moving as she speaks with composure yet deep anxiety about the uncertain future her peer group is facing. Residents of all ages speak to the war in this film with very little evidence of hostility between generations, shattering another iconic image of those politically tumultuous times. 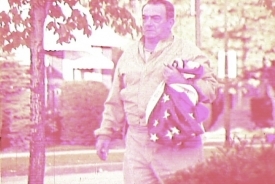 8 FLAGS FOR 99 CENTS scrambles stereotypical portraits from an era in American history that is remembered for its theatrical, abundantly vocal and sometimes violent unrest. This film presents an alternative and quieter picture of a community’s anguish in the face of an unpopular war. Residing in the very heart of middle America, 8 FLAGS FOR 99 CENTS signals the certain demise of a post WWII culture. Thanks to the grant from the NFPF, this title will also be color corrected since the only remaining copies have faded to red. A MATTER OF OPPORTUNITY is an outreach film that was sponsored by the American Medical Association (AMA) and the National Medical Association (NMA) in response to the burgeoning civil rights movement in the U.S. and the limited opportunities afforded to African-Americans in the field of medicine. MATTER OF OPPORTUNITY signals a seismic shift in thinking and action within the institutions of education and medicine in the 1960s. Chuck Olin filmed this work at the Howard University Hospital. It is a series of interviews of African-American medical students, doctors, nurses and other health professionals who worked at the hospital. Among them is the first student in Howard University’s dual M.D./PhD program, Dr. Randall Maxey. 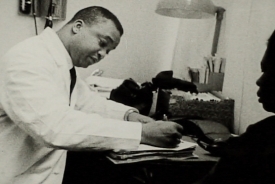 Deeply attracted to the ideas of the Reverend Martin Luther King, Maxey was torn between law and medicine after graduating from University of Cincinnati in 1966 with a degree in Pharmacology. In the end he chose medicine and established a career in fighting kidney disease that is matched by his commitment to erase the health disparities between the general population and the underserved minorities. He is founder or the Association of Minority Nephrologists and the Church Health Network. Currently he serves on the board of the Unity One, Anti-Gang Advocacy Program, is president of the National Medical Association and is a member of the Congressional Black Caucus, Health Policy Advisory Commission. 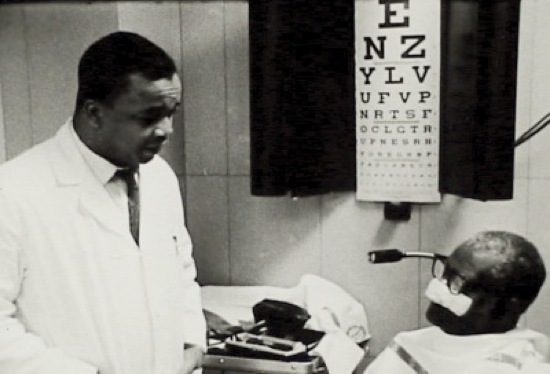 A MATTER OF OPPORTUNITY is important historical documentation that gives voice to Maxey and other African-American professionals and students at a time when obstacles to their careers in the medical field were still firmly in place.